Lexington, KY– After a 32-point pounding of fifth ranked Kansas, the Kentucky Wildcats, at least you would think, have established themselves as a credible crew and deserving of the top spot. This Wildcat craze has spread all the way even to the NBA with Suns star Eric Bledsoe saying he would take Kentucky over the Sixers if NCAA teams could ever play an NBA squad. But I’m here to play the devil’s advocate and beg to differ. How? Kentucky is not THAT good, Kansas was just THAT bad one night. Depth may be a huge advantage for the Wildcats, but if they were to go up against Arizona they would get wrecked like no tomorrow. Two of Kentucky’s first three games have been at home, so it’s far to analyze and say that we haven’t all had a fair shot to see how they perform at home. Anybody can win at home…anybody. You’ve got the crowd behind you, personally you’re all amped up, and you just feel like there’s absolutely no way you can lose with all the odds seemingly in your favor. But in college basketball, that all changes when you go into somebody else’s house. READ: Who should the Wizards draft? 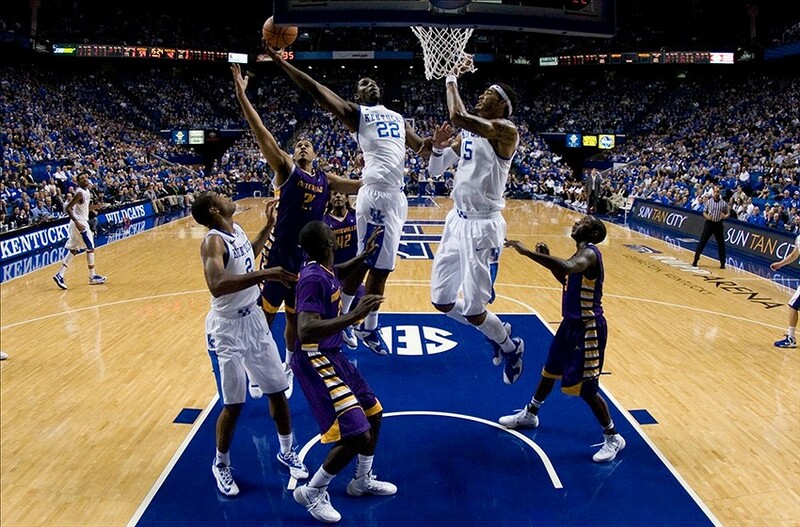 A second thought is this–Kentucky’s schedule is extremely weak. Up next they play Boston University, then Montana St and others. Their next ranked match-up isn’t for two weeks and comes against currently tenth Texas. The second week in December is when things get really testy for the Wildcats. In two of their three games that week they must go up against North Carolina and then Louisville. The Tar Heels and Cardinals are ranked sixth and seventh respectively. After the Louisville game, no ranked opponents are in Kentucky’s way until the final game of the season at home versus Florida. So yes, Kentucky may have a fabulous record, possibly even undefeated, but we’ve seen how much March Madness un-invites apparent Cinderellas. And trust me, Kansas didn’t take the whopping lightly.